If you have straight hair, you may be wondering how to get curly hair for men. Fortunately, it’s very possible to make straight hair curly with the right men’s styling products and tools. As long as you don’t have very short hair that won’t curl at all, this tutorial will show you exactly how simple it is to get a wavy or curly hairstyle with thick, straight hair. Below, check out our step by step guide to perm or curl men’s hair, including the top-rated hair styling products and blow dryers you’ll need to create curls that will last. Most guys will be surprised to learn that the process of making hair curly is pretty simple and easy. However, to curl short, medium and long men’s hair, there are a few main products you’ll need: a heat protection spray, sea salt spray, and hair dryer. For the best chance of getting curls that will stay in place all day, follow these steps. Wash your hair. For starters, you’ll need clean, wet hair. Damp hair is generally easier to style and manage, not to mention sea salt sprays work best on wet locks. Wash your hair with a high-quality, all-natural, rejuvenating shampoo and conditioner. Afterwards, towel dry but leave it slightly damp. Apply your heat protectant. 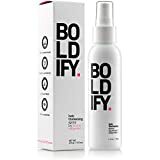 Using a heat protection spray will not only insulate your hair from heat damage that may dry out or frizz your strands, but it will also allow your hair to dry quicker once you start blow drying it. 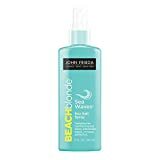 Use sea salt spray to get wavy or curly styles with movement. Spritz a good sea salt spray on your head. To evenly distribute, lift your hair from the root and apply. Otherwise, you can work it through with your hands to ensure it gets from roots to ends. The sea salt spray is vital to adding textured, natural-looking waves and curls to your hair. Blow dry your hair. Once your hair is prepped, it’s time to use a good blow dryer to make the curls. If you have a diffuser attachment, be sure to use it to disperse the heat evenly across your head. This will spread the heat to enhance the curling affect, add volume, and minimize frizz and heat damage. If your hair dryer doesn’t come with a diffuser, just remove the nozzle to create a wider stream of air. Get your hair curly. To effectively dry your hair to get waves, be sure to dry from the bottom up and place the air directly on the roots, pushing up. While placing the heat on different parts, use your other hand to scrunch the sections that the heat is touching in order to activate the hold of the sea salt spray. As your hair starts to feel dryer, add more salt spray for an even curlier look. Create individual curls. Guys can try wrapping small strands around their finger and blasting the heat directly on the hair to create a more defined style. If certain sections are not yet wavy, you can spray those areas with sea salt spray again and blow dry as needed. Finish with a styling product for hold and texture. When your hair is dry, add a pliable pomade or cream to hold your curls in place. At this stage, feel free to finish styling your hair with your fingers to get the exact look you want. With these tips in mind, you’re probably wondering about the best products to help you make straight hair curly for guys. Here are the best styling products you’ll want to buy. When looking for your heat protection spray, remember that it doesn’t have to be expensive to do the job well. These sprays are meant to act as a barrier between heat and hair, thereby preventing breakage, minimizing frizz, and increasing shine. Look for a water-soluble spray and all-natural ingredients since this will provide maximum protection but still be washed out easily. Here are a few of the best heat protectant products you’ll find on the market. 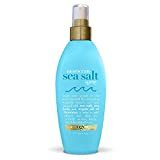 For the best sea salt sprays, try OGX’s Moroccan Sea Salt Spray for an extremely affordable option that adds just the right amount of salt and creates natural, beachy waves. This spray is infused with sea salt, sea kelp and Argan oil to keep your curls looking naturally tousled and smooth. Another good sea salt spray product is Tresemme’s Perfectly (Un)Done Sea Salt Spray. This one is also super affordable and offers a professional-quality product for natural-looking textured waves and curls all over. It’s infused with sea kelp extract to help you get soft, tousled hairstyles that won’t feel stiff. Here are some of the top-rated sea salt sprays for men. 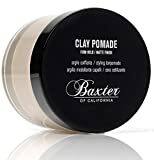 When buying a good pomade, wax, cream or clay for curly hair, it’s vital to look for a flexible styling product that can hold hair in place without weighing down your curls or making your strands feel stiff or greasy. Paul Mitchell’s Tea Tree Shaping Cream is a great choice for a strong yet flexible cream that creates long-lasting hold with movement. 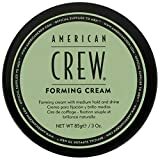 Another leading pick is American Crew’s Forming Cream. 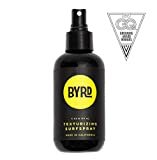 This medium-hold styling cream provides a solid hold with a moderate amount of shine, keeping your hair pliable enough to move and natural-looking. Here are some of the best styling products for curly hair men. Guys with curly hair have many options. If you plan to make your hair curly or wavy, here are the best curly hairstyles for men! The curly fringe hairstyle has been one of the most popular styles of the year. With short hair on the sides and thick, textured curls on top, a fringe allows for a stylish finish. The curly hair fade is the perfect “short sides, long top” hairstyle for guys with curls or waves. The fade haircut has many variations, including bald, high, mid, and low fades, and all of them style nicely with curly hair on top. Men can even choose to get a line up to clean up their hairline or go for a curly hair undercut instead. The quiff haircut continues to be an iconic and timeless hairstyle for men around the world. Whether you have short or medium-length hair, the textured modern quiff can be styled beautifully with curls for a unique look that’s sure to stand out. Just a quick guide to getting curly hair. Start with clean, slightly damp hair. Apply a heat protectant spray. Keep in place with a styling product. Making your straight hair curly is very doable if you take the time to buy good hair products and a quality blow dryer, and practice a bit of at-home styling techniques. As long as you have short to medium length hair, having waves or curls is possible if you follow the steps above.